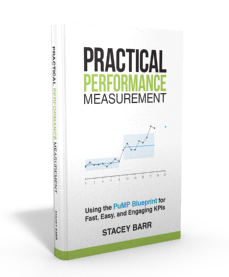 How to find the right measures or KPIs is the most asked question in the field of performance measurement. And it’s little wonder, because the more meaningful measures track outcomes which tend to be less tangible than the traditional things we’ve measured, like how many widgets we produced. 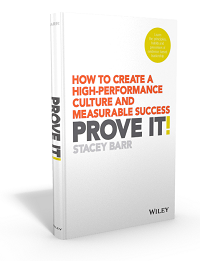 How do you translate results so intangible as employee morale or service quality or corporate image into solid, robust measures? Well you need to first have a result that is measurable. This means it is clear enough to be observed or detected in the real world. If it can’t be observed or detected in the real world, we can’t measure it. Measurement is based on evidence. If you don’t know the evidence of your result or goal or outcome, how can you ever recognise if and when it’s happening? You can’t. The framework described here is an excerpt of Step 3 of the PuMP Performance Measure Blueprint. PuMP is a systematic approach for taking almost all of the painful effort and wasted time out of the challenge of finding the right measures. STEP 1: Begin with the end in mind. Performance measures provide us with objective and quantitative evidence of an important performance outcome or result we want to achieve or create. It is of the utmost importance that we decide which outcomes are most worth tracking right now. As our first step in deciding how to measure a result, we write down what the result is, what the difference is we are trying to create. And we focus on one result at a time. STEP 2: List the sensory specific evidence. When we have the end in mind, we’re ready to get a handle on what specifically about our result we will measure. This is where we take care in our choice of words to describe the evidence of that result, as tangibly as possible. We use “sensory” language – the language that describes what we and others would see, hear, feel, do, taste or smell if our result was happening now. It’s critical to avoid those inert weasel words that we so often see in our goal and objective statements, such as: efficient, effective, reliable, sustainable and quality. STEP 3: What are the potential measures? Now, we get ultra specific and figure out what the potential measures are that could let us (and everyone else) know that the result is being achieved. For each of our sensory specific evidence from step 2, what could we count or quantify to tell us the extent to which it is occurring? Each potential measure needs to be written as clearly as possible with this 4-step recipe. Then we test which of these potential measures would be the optimal balance between relevance and feasibility. STEP 4: Check the bigger picture. Now we check the bigger picture for what could happen if we measure our result. What level of control or influence do we have over achieving it? What might the unintended consequences of measuring the result be (both the positive and the negative)? What behaviour would the measures drive? Which other areas of performance might be sabotaged or limited? This is a great chance to change our mind about what’s most worth measuring. STEP 5: Name and describe the measure. Naming our performance measures or KPIs marks the point at which we know exactly what we will be measuring. Being succinct and informative and deliberate in how we name and describe each measure matters lot – so no one jumps to the wrong conclusion about what’s to be measured and how. Remember that this is just one technique in the process of selecting, implementing and using KPIs or performance measures. There are eight steps we need to follow, and we’ve just explored Step 3. Create your own measure design template based on these 5 steps (or save time and use mine, which includes examples and more detailed instructions, in the PuMP Blueprint Online Program or the PuMP Blueprint Workshop). Now use your measure design template to start designing measures for the tricky goals and objectives and results and outcomes you’ve struggled to measure thus far. Practice leads to mastery! I always wondered about the measurement of performance of bussiness entities from my own point of view as a Finance Manager. The subjective appraisals like employee evaluation , corporate image are all the more frustrating for finance professionals who measure things in numbers. When I got this site KPI’s started getting closer and easier. This site has treasures of knowledge and real life experiences. The presenations make it easier for grasping the material. I wish the author a success in her endeavours. The key to getting the right measure or KPI is the harmonization of plans, processes, information, resource decisions, actions, results, and analyses to support key organization-wide goals. Integration, in short. Effective integration goes beyond alignment and is achieved when the individual components of a performance management system operates as a fully interconnected unit. The management of any organization can be improved if the organization is considered a series of inter-related systems. The systems approach suggests that internal management systems are both intra-related and inter-related with the environment of the organization, and performance measurements should highly consider the inter/intra-relationships of systems, processes and departments within the organization.